Tomorrow (feb 4th) is my blog's second blogoversary! I can't believe I've been blogging for two years already! Not to mention the hundreds of goodies I've baked these last two years. It has been such a joyeus and therapeutic thing for me to do and I'm so grateful for all of my wonderful readers. To celebrate my blog's birthday, I wanted to make something bite-sized and festive. Lately I've been obsessed with everything almond, so the decision to make almond cupcakes was easily made. 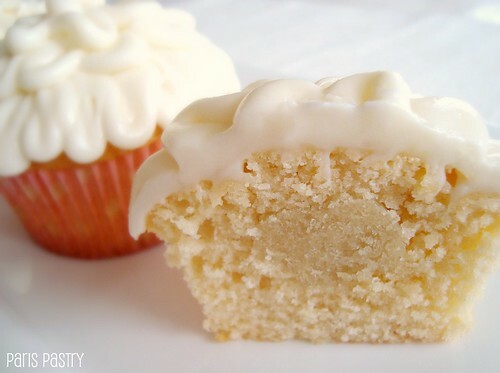 I decided to go with a cream cheese frosting instead of a buttercream kind because the almond cake and the marzipan center are incredibly sugary, I wanted to balance that with the sourness of the cream cheese, and not pass out in a sugar coma. 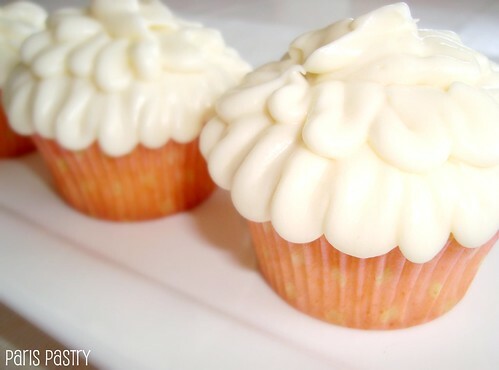 I used a Wilton 104 tip to frost these cupcakes. Rating: 4.5 out of 5. Marzipan-Filled Almond Cupcakes: cake recipe adapted from "The Complete Magnolia Bakery Cookbook"
- In a large bowl, on the medium speed of an electric mixer, cream the butter until smooth. Add the sugar gradually and beat until fluffy, about 3 minutes. Add the eggs, one at a time, beating well after each addition. Add the dry ingredients in three parts, alternating with the milk and almond. With each addition, beat until the ingredients are incorporated but do not overbeat. - Using a sharp, small knife cut out a 1-inch center. Set aside the 'cut-out' cake piece. 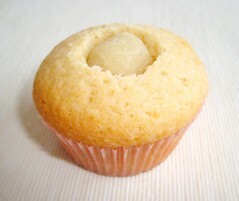 Fill the cupcake with a marzipan ball. Top the marzipan ball with the left-over cake piece, pressing down to flatten the cupcake. Continue with remaining cupcakes. - In a large bowl, on medium speed of an electric mixer, beat the cream cheese and butter until smooth, about 3 minutes. Add the vanilla and lemon juice and beat well. Gradually add the sugar, 1 cup at a time, beating continously until smooth and creamy. Use immediately, or cover and refrigerate for 2 to 3 hours, but no longer. See the marzipan center? Scrumptiousness! happy anniversary! 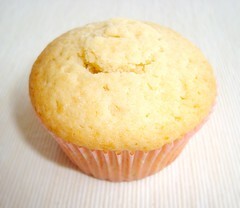 such muffins looks so delicious! Happy anniversary - and these cupcakes look gorgeous! These are so gorgeously piped and would be such a unique flavour! What perfect celebration food for your 2nd blogverysary. Happy Blogging ! Oh that filling looks wonderfully rich and delicious! Also loving the way you frosted these. Happy 2nd blogiversary and I look forward to another great year! super gefeliciteerd!! happy anniversary :) twee jaar alweer. ik moet zeggen, ik vind deze schatjes er heerlijk uitzien. The muffins look really cute. Those look delightful! Happy anniversary! HAPPY BLOGOVERSARY!! And what a way to celebrate, these look amazing. Isn't anything almond simply the best? Well Done!! 2 years of blogging shows your enthusiasm hasn't waned - I so enjoy your recipe's. Happy anniversary and congrats for your blog!! the mazipan center is a great idea and these cupcakes look really great!! Happy Second Blogiversary! 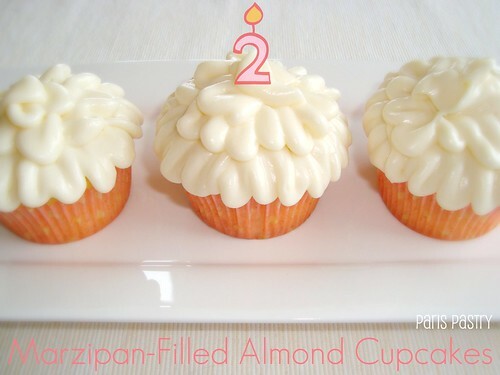 The Marzipan-Filled Almond Cupcakes look absolutely delicious! I love almonds so I will definitely give these a try very soon! Happy blogiversary! I have been following you for such a long time, I will never tire of looking at your wonderful baked goods! Happy Anniversary! I am a big fan of your blog. 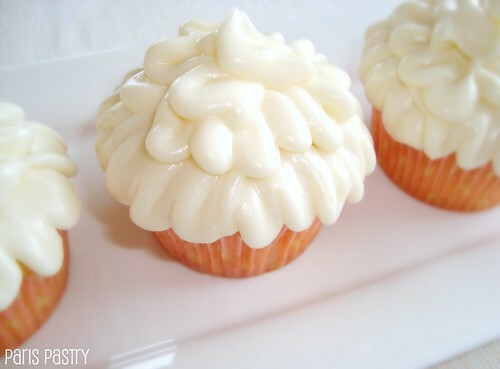 And these cupcakes today look lovely and delicious! Happy blogoversary! I hope you have many more. Meanwhile, that last photo is positively driving me crazy--looks so good! Hooray, happy anniversary! And marzipan is up there with chocolate as the most awesome stuff in the world. Happy (belated) blogoversary. Looking forward to another year of your wonderful and delicious blog posts. Okay, that big hunk of marzipan in the middle of the cupcake has me salivating. Heaven!! Happy belated blog anniversary. I am a new follower and I am loving all of your recipes.